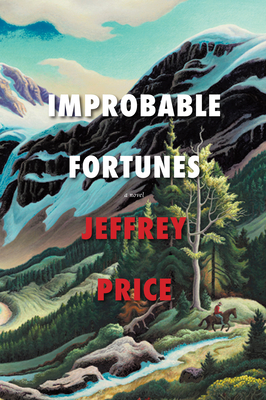 In Improbable Fortunes, Jeffrey Price takes us on a wild ride into Vanadium, a dusty, down-on-its-heels mining town in southwest Colorado--where it would be fair to assume that nothing has ever happened. But you'd be wrong. As it turns out, quite a lot has happened, starting with a suspicious mudslide that destroys the town's Main Street and a cowboy, Buster McCaffrey, arrested for the death of one of the richest men in America, Marvin Mallomar. As the soon-to-retire Sheriff, Shep Dudival, investigates the circumstances surrounding the murder, it comes to light that Buster and Mallomar's young wife were having a Cowboy Always Rings Twice affair. From there, Price takes this familiar story plot and turns it on its head--folding a rococo cast of Vanadium's characters into a timeline that begins with Vanadium's post-WWII labor strife and ends with the Kulturkampf of present day. While it may all seem humorous and surreal at first blush, one gets the feeling by Improbable Fortunes' unguessable conclusion that Price has used the fictitious town of Vanadium--a place without a recognizable gas station, a decent restaurant, or a clean bathroom--as the Rosetta Stone for something larger. Jeffrey Price is a screenwriter best known for cowriting Who Framed Roger Rabbit, How The Grinch Stole Christmas, and Shrek III. Seeking the refuge of small-town life, he moved his family from Los Angeles to southwest Colorado.